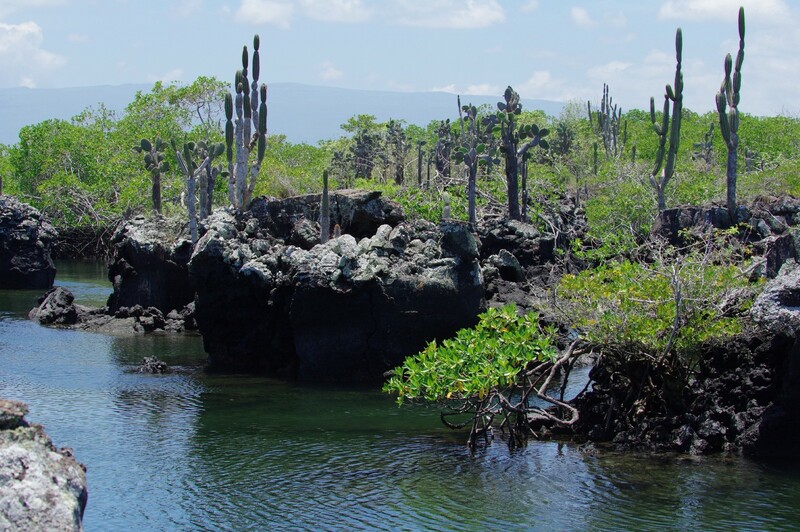 Los Tuneles, Isla Isabela, Galápagos. Photo by Bret Weinstein. In fact, the truth is worse. Nature is not out to get you. It is indifferent to you. We had been immersed in nature on this trip. Explorations of rainforests, cloud forest, páramo. Slogs through mud and mule dung. Hikes around an equatorial crater lake rich in wildflowers; on the rim of a barren, active volcano; in a windblown, horizontal-rain fantasy landscape 13,000 feet up. Swims through lava tubes long since cool. Nearly everywhere we were and had been, someone got got, at least a little. But it was never personal. A wasp sting here, an ant bite there. Gut bacteria from a land new to North American intestinal tracts, causing trouble. Fungal trespass on skin, trying to make a new home for itself. Woolly monkeys defending their space. A storm-whipped tree fall deep in the Amazon. We are the outsiders here. The invasives. What is already here is doing what it does. Nature is not out to get us. But that doesn’t mean that we won’t get got. We were arriving at the end of a long trip: more than ten weeks traveling with 34 people, in close quarters most of the time. Bret Weinstein and I, co-professors and collaborators in nearly all things in life, leading 30 undergraduates, and our two children, then 9 and 11 years old, in a field study of evolution through the many habitats of Ecuador, culminating in the Galápagos. One fine Friday, the class had agreed to meet before dinner and once again collect our gains, intellectually speaking. We would share observations and insights, and interpret them together. But only four of us showed up. Later that evening, dinner long since postponed, the rest of the crew began straggling in. “There was a parade!” they told us. “In honor of Good Friday. The streets were cordoned off, and we couldn’t get through.” Here, in the most iconic evolutionary landscape on Earth, all traffic was blocked to mark the passing of the son of God. 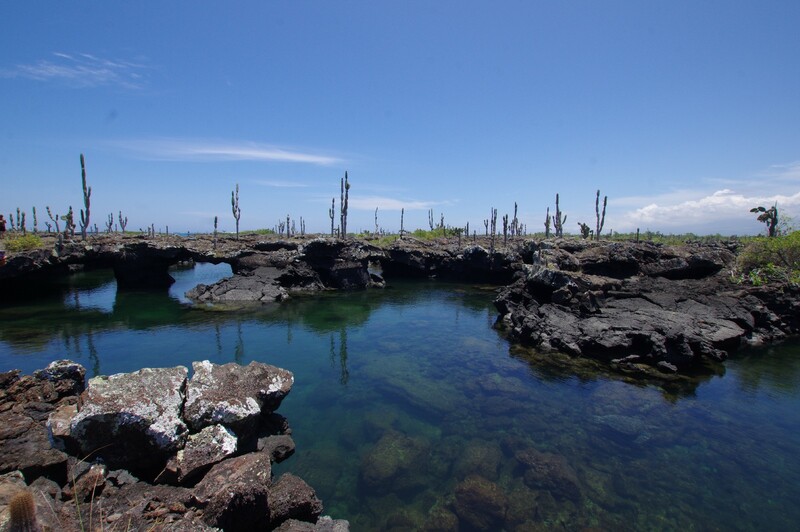 The faith of the good people of Galápagos lives in tension with their role as stewards of hallowed evolutionary ground. On Good Friday, Darwin takes a back seat to Jesus. So we put off our discussion. The next morning, we were off to Isla Isabela, large and young, volcanically active, penguins swimming among the boats. 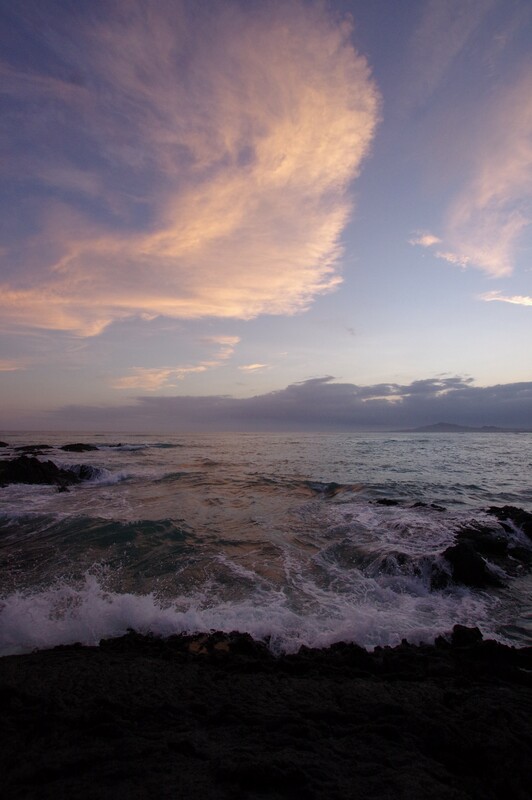 There are marine iguanas, bellies fat with sea greens, undulating through the water, their spiny backs poking above the surface. 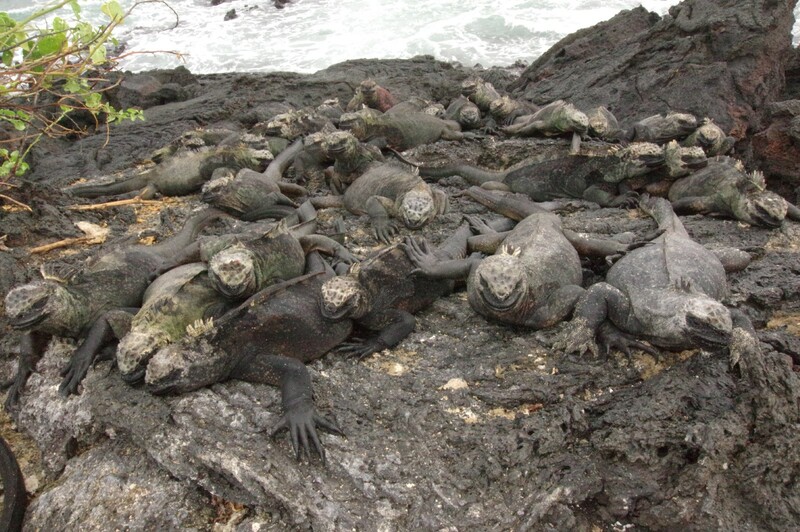 Piles of marine iguanas on lava rocks, fermenting those greens in their cow-like stomachs, spitting out what they don’t need. Rays, so many rays. A diamond stingray, staying close to the sandy bottom, trying to dig itself in, becoming cryptic on the ocean floor, outed by crafty damselfish. Yellowtail damselfish, so territorial they bite at rays. They bite at people, too. Green sea turtles, diving, nibbling on algae, being harassed by more fish. Sharks and snappers and sealions. All these animals so conspicuously unafraid of humans, just as Darwin described. Four days from done, on March 30, 2016, twelve of us — eight students, our guide, the captain and his second, and I — head out for our last communal excursion. We’re on open water for an hour before cutting into a cove on the south edge of the island, a cove protected by a natural breakwater of giant, jagged chunks of lava, tossed into the sea by eruptions not too long in the past. The concentration of wildlife in the cove is stunning, even by Galápagos standards — more penguins and turtles, giant schools of snapper. But the access is treacherous and, we would discover later, should not be attempted if the conditions are anything but perfect. Even when the conditions are right, there is no margin for error, human or mechanical. The conditions aren’t right on this day. Not even close. We have not been consulted about the special risks we have taken. The day before, Bret had gone to the same spot with a different group of students. The conditions had been good then, and yet the danger was sufficiently clear to him that he had made an announcement at dinner about the particular hazards of crossing through the breakers on the way out of the cove. Our boat, El Pescador, is a 20 foot fiberglass speedboat propelled by two powerful outboard motors. Leaving the protection of this glorious spot, Juan, our official National Park guide, a large, muscular man with deep black skin, armed with both keen intelligence and considerable experience, looks intently out ahead of us. To get out through the breakers, the captain needs to wait for time and space to align, for a lull in the waves to match a gap between lava boulders, before going full throttle to reach the other side. He must accomplish this before another insurmountable wave forms. The waves today are big and chaotic, and everything must go exactly as planned. Juan says to us — stow your bags under the seats, everyone make sure your life vests are on. These students and I are close. I have chosen the groups for these last excursions carefully, and this one has the young women whom I have taken, privately, to calling the baby birds. We have been together for nearly two years now, since most of them were just starting college, and they have impressed me, always. I feel protective of them. There are six of them, plus two young men, one of whom, Griffin, I have also come to know well over the previous two years. With the approaching end of this study abroad trip, these excellent students whom I’ve come to know so well, are about to fledge. A wave, maybe six feet, comes at us as we head into the surf, perpendicular to the oncoming waves. I am sitting in the port bow; my student Kirstin is opposite me on starboard. We both grab the railing before the boat hits the wave, and are lifted into the air, coming down hard on the fiberglass. Kirstin hits her head, hard. There is silence in the front of the boat, a seriousness. We don’t know it, but the captain has lost control of the boat. The wave has drowned the engines. The boat begins to drift. Port, where I sit, is now towards the sea, facing the next gathering wave. Lily and Odette, who are near me, joke “well, if this is it, it’s really been great. Heather, thanks so much for an amazing class.” Apparently, in the back of the boat, other students, who don’t yet sense that anything terrible could happen, because they have faith that the captain knows what he is doing and that machinery does not fail, are making similar jokes. Dorrie, who is also sitting in the back, and who grew up on commercial fishing boats in Alaska, would later would tell us that the next wave, the one that got us, was 20 feet. I don’t know. That seems impossible, but I have no way to assess it. Most of them, though, have nothing to hold on to. Up front, where I am, there is a metal rail. I grab it and brace myself, not wanting to be thrown up into the air, or worse, into the sea. I know that staying with your boat is how you stay alive. Just like being seat-belted in to your car is how you survive a crash. Being tossed into this violent surf amongst these jagged lava boulders is a terrifying prospect, and I am determined not to let it happen. But that logic, that plan, assumes a great deal. It assumes that the boat survives the accident and makes it to safety. A boat that capsizes turns this logic on its head. In a matter of moments, the boat goes from our greatest asset, to a possibly lethal liability. Sometimes, being thrown free of your car is what saves your life. Sometimes, being thrown in to the water and left to bounce around in chaotic surf near jagged rocks for far too long is a better outcome than remaining attached to your boat. Most of the students are thrown free as the boat violently flips. Odette and Lily are trapped by the metal bars around their seat, and are rolled under the boat as it inverts. Lily dislocates her shoulder. Odette sustains a concussion and a shoulder injury, and while trapped under the boat becomes tangled in lines, from which she has to free herself. The captain, too, is entangled, and is not wearing a life jacket. He swallows and inhales the gasoline that pools on the surface of the water. Griffin leaves a life ring that he and others have found to rescue the captain, the captain who, in his confusion and fear, almost drags Griffin down with him. Griffin saves the captain’s life, and does not lose his own in the process. I know none of this for a long time. What I do know is that staying with your boat is how you stay alive. So I hold on to the damned boat. The wave hits and it is searing chaos, impossibly loud, firehose water everywhere, me holding on to the metal railing with my left arm, as the boat rears up and bucks and finally flips, all the while thrashing my body, over and over and over again against hull and hardware, fiberglass and metal. I hold on to the boat through all of it. The water comes and comes and comes and it is fast and dreadful, whipping me, slamming me, darkest green and brightest white, screaming and foaming, and it feels like the end of the world, a whirlpool tugging into darkness and depth and death. And then, suddenly, nothing. Utterly still. No movement at all. And silent. And fully dark, nothing through the darkness, no sense that there might be color out there somewhere, just a kind of lapping, sloshing, stillness, like the longest night has fallen and perhaps there had been people once, but now there are no more. I am under the boat, trapped, with no air. Into my head, in front of my eyes, images come: my two boys, my man. And a mantra: I am not allowed to die. I make a lateral move. Pause to assess, air in my lungs diminishing. No change: no movement, no light, no sound, nothing. I am not allowed to die. Another lateral move. Still no change. This time I give myself a quick pat down, checking for obvious injuries. Ohh…the fact that I can actually feel my bone, my tibia, from the side of my calf where there was, until moments earlier, quite a lot of muscle, is not a good sign. I see my boys again, in my mind’s eye. I am not allowed to die. I move laterally again, feel movement, swirling water, open my eyes, see light above me, shoot to the surface, grab a mouthful of air, and am immediately smacked by another wave. I go limp in it, rag dolled about, and know that my injuries go far beyond the scoop of flesh I’ve lost from my leg. I have broken ribs at least. The wave abates, and I come up for air again. I have lost one contact lens. Without both, I can barely make out shapes right in front of me, but with one, I can squint and see, kind of. Where is everyone? I see nobody. I hear nobody. Where even is the carcass of the boat? I seem alone in a vast sea, but for the detritus of our lives: A water bottle. A flip flop. I am seized with terror at these objects, floating by, silent. What has become of their people? I have only the barest hold on my life jacket. Mi chaleco.It has been the difference between life and death. Another wave comes, and panic rises in the back of my throat — I don’t have enough air, cannot dive through the waves like I normally would, but why? Oh. I cannot move anything on my left side. I go limp again instead, let the wave tumble me. Excruciating pain sears through me, zigzagging white hot. The wave over, I breathe, bobbing on the surface. A life jacket floats by. Who does it belong to? Mine is only around one arm now. I reach for the one that floats by, put it on my other arm, best I can. The brief calm between waves allows more thoughts in: Might my broken ribs puncture a lung? Where are my people? How close is the shore, with its deadly sharp volcanic surfaces? Is anyone still trapped in the boat, under it? Another wave, another ragdoll. My experience playing in the waves as a child, in southern California, probably serves me well here. I can recognize the wave chaos, even from the inside, destroyed as I am, and know when to push to the surface, quickly take the breath that I need. How long were we all in the waves, being buffeted about, battered, before every single one of us found our way to one of two life rings which flew into the water when the boat flipped? Forty five minutes is one number that will be proposed by enough people, independently, that it seems plausible. I have no idea. The midday equatorial sun is high in the sky, and offers no clues. How does one measure time in extremis? I see a life ring, and on it, Juan, our guide, and Lily. My relief is tempered by the recognition that none of us are safe yet, and I have no idea if all of us are even close to safe. Also, the students still need me. My injuries, which I have no idea the extent of, cannot become central until and unless everyone else is safe. I make it to the life ring. A wave comes, smaller, but now we are tumbled together, the three of us. We are close enough to shore that we must worry about being thrown onto the razor sharp rocks. In the calm afterwards, Rachel appears, then Val, deeply shaken, unable to reach the life ring. I grab Val, pull her in. She is trembling. The captain’s second, whose name I have lost to trauma, appears on the life ring. He has no life jacket, and I try to give him the one I have picked up. “No se importa,”he says, several times, panic visible in his eyes. I think — it’s not important? How could anything be more important right now? I do not argue the point, and maintain my hold on both life jackets. We can see land now — or rather, I can see land now, perhaps those with intact vision could see it all along. Juan and I tell the others — kick towards land. We must get to that rock outcropping with intention, before we are flung there, out of control, by an indifferent ocean. One other boat is out here today, the only other craft for at least twenty miles in any direction, and it has been witness to the accident. The boat moves to help, dropping its passengers safely on land, then coming as close as it can to where we are. It reaches those on the other life ring and takes them aboard. I am now stranded with five others on a sharp lava outcrop. I cannot stand up. I say to Lily and Rachel and Val, over and over again — Is everyone on the boat? Yes, they say, everyone. No, I say — name them. Tell me who you see as you see them, so that I know. And they do. And everyone is indeed there. Something breaks inside of me, as simultaneously another thing is fixed. Somehow, no one has drowned. But the six of us trapped on the lava outcrop still need to get to the rescue boat. I beckon to Val. She is my official logistics aide on the trip, in addition to being my student. She is also fully bilingual, having spent her early years in Chile before moving to the United States. I say to Val: “I have serious injuries. I don’t know their extent, but I may lose consciousness. I need you to know what I know about them.” She sees the hole in my leg. She gasps, turns away. Except for the rocks, everything in this bleached world seems a searing white — the surf, the sky, my exposed bone, glinting in the sun. I had forgotten about the hole in my leg. I don’t feel the hole in my leg. In fact, except for being stitched up with no pain meds a few hours hence — and then, two days later, having the kind doctor unstitch, dig out the dead tissue, and stitch it up again, all without anesthetic — I never do feel the hole in my leg. The pain thrumming through the rest of my body overwhelms whatever is happening my leg. This tells me something about the extent of my other injuries. 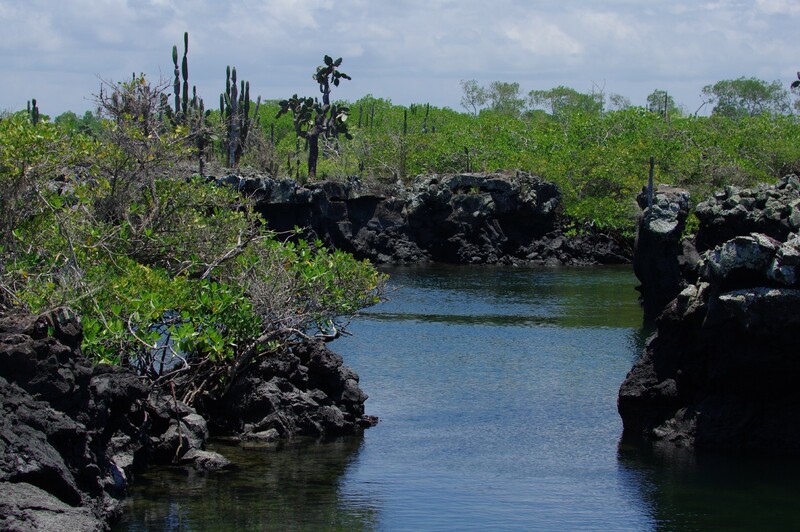 Juan tells me that we must make our way, through rough but shallow water to the next lava rock outcropping inland, in order to get on the boat that now holds the rest of our people. I can’t do it. He tells me that I must lead, that my students will not go unless I go first. He is right, but I don’t know how to do it. I am destroyed. He pushes me in to the water — he doesn’t know my injuries, but even if he did, it is necessary. I must go. I scream, raked across the lava rock by more waves, unable to use my limbs. I make it to the other side, and Juan is there, my students following. We are now, all of us, in the boat, a new boat, very much like the old boat, which has now begun to break up on the rocks. Over the next few days, a complete clean-up will be done, the hull removed in sections, cut apart with chainsaws. No trace of the Pescador will be left. On this new boat, our new captain needs to wait for a lull in the waves to match a gap between lava boulders, before going full throttle to reach the other side. Just like what was supposed to happen before. We are scared. Four of us sit, on the floor in the back of the boat, holding hands, trying to be calm. My students have all seen the hole in my leg now. I don’t tell them what I believe to be true. That my whole body is broken. That I may yet not survive. One of the baby birds is so panic stricken at the prospect of going through the break again that she tries to climb out of the boat. She is held back by another, physically restrained. We make it through. Once on the open ocean, the rhythmic thump-thump-thump of the boat on the water is excruciating. I cannot help but vocalize, guttural, in pain, with every bounce. My students look at me with deep concern. I try to reassure them. I do a very poor job. Ten, fifteen minutes later, we are met by a coast guard boat, which has been called to pick us up. Both boats are bouncing high in the waves. There is no lava rock to worry about here, nothing but open ocean, and erratic, unpredictable water. I can’t imagine how I am supposed to transfer between these boats in my condition. The coast guard men watch me move, see some of the truth of my condition that I have not vocalized, and put me up against the front of the boat, my back supported by a wall, where I will be bounced around the least. We are told that Bret, and the rest of the class, know that there has been an accident. That they will be waiting for us. 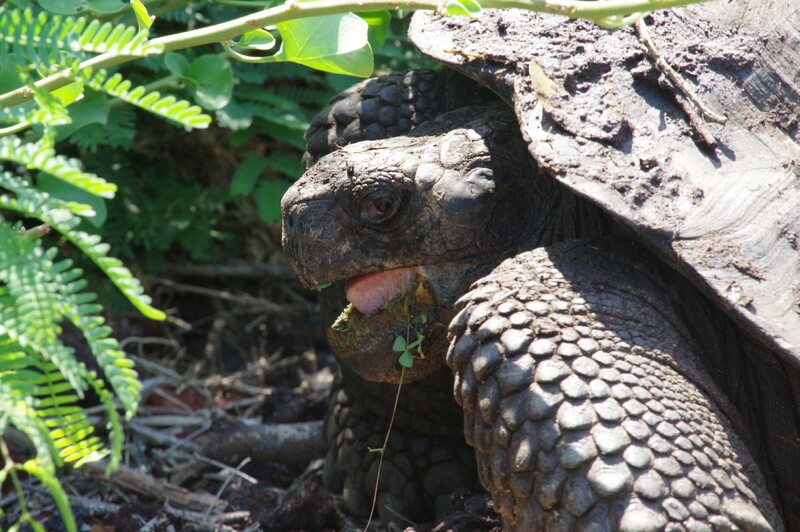 Back in Puerto Villamil, Bret has just returned from looking at giant land tortoises with our boys, when he is pulled aside by a member of the staff, told that there has been an accident. Bret grabs his bag and runs to the dock. He passes our student Robert, tells him there has been an accident with the Pescador, tells him to grab our boys and meet him at the dock. Word has spread across town, the only permanent habitation of any size on the island. Every police officer, official and all medical personnel are waiting at the dock. As Bret arrives, he hears el esposocirculate ahead of him — the husband — as he tries to find out if anyone knows anything about the injuries. No one seems to, or at least, no one will tell him. The boys arrive, and the students. As Bret tells it, the next half hour passes in slow motion, as if on another plane, a plane that hovers between two possibilities: Will the rest of their lives be lived in the shadow of whatever happens next? Is this the moment, before which and after which, everything is different? The coast guard boat finally comes into view. Bret trains his binoculars on the distant boat. There are no clues. Students are visible in the back of the boat as it pulls closer. One by one Bret is able to identify them, but I am nowhere in sight. The coast guard has told me that they will backboard me off the boat, that I am not to move from my position, which is unintentionally completely hidden from view, until they return with a board. We dock. Students disembark. Several are visibly injured, many in tears. Val, in shock and sobbing, approaches Bret, who is by now firmly in his “emergency mode”. “It’s Heather,” Val says, with fear and terror in her eyes. “Is she alive?” Bret asks her. “Well yes,” she says, confused. I am placed on a plank and carried to the back of a rusty police pick-up truck, then driven down the bumpy sand roads of Puerto Villamil. We arrive at the medical clinic, which has a warm, skillful, and entirely female staff. The clinic on Isabela has suture kits, cleansing solutions, bandages, but few resources beyond that. There is no toilet paper. There is no ice. There are no pain medications. The young doctor, Estefania, fresh out of med school back on the mainland, in Guayaquil, is drawn immediately to the hole in my leg. They are all concerned about infection, about gangrene. I am not concerned about the hole in my leg. I still can’t feel it, but I can feel my ribs. This health clinic, so short on supplies that by the end of my stay they are using masking tape to secure gauze to my wounds, has one very old x-ray machine. It doesn’t find all of my broken ribs, but does find one, as does Estefania. She palpates my left side, nods. She says to me, in Spanish that I can miraculously understand in my fragmented state, “Yes. You are broken. But you are going to be okay.” Rota, pero estable. Broken, but stable. Bret’s emergency mode is both extraordinarily efficient and effective. He takes care of everyone as best as humanly possible; better, in fact, given where we are, given what has happened. He gets Lily med-evaced to Quito to have her shoulder reset, as they cannot do that in Galápagos. I should have gone too, all the way back to the States, but I refuse. This trip has been too important, too long in coming, and I cannot bring myself to abandon it, or these students, now. The captain nearly dies that night, in a room next to mine in the medical clinic that literally opens up on to the sandy beach. He swallowed so much gasoline while trying not to drown. He does not die. The students and I spend many hours over the next days talking about what happened, bringing our understanding of it into coherence with one another’s. Some of the students, thrown free and uninjured, are snorkeling the day after the accident. I will not snorkel for a very long time to come. The pain I feel is unlike any other I’ve experienced, all encompassing, endless, isolating. I become lost in its caverns. For days, there is nothing but pain. Movement reveals pain, as does stasis. It feels like an endless metallic void of jagged shards, out of which I will never escape. When I close my eyes, I see torrents of water, feel the land disappear beneath me. As soon as I can, I begin walking. Walking, walking, walking, for months, to get movement back, to ensure that this is not the end of my mobility. Three years later, the students are healed from their injuries, but I still feel the impact of many of mine. The accident tore muscle and meniscus, broke bones and cut myriad wounds, created bruises on every inch of my body except for my face, which was spared. My neck was bent the wrong way; fractures in my pelvis caused shooting pains and shifting asymmetries in my gait; several of my vertebrae were rotated out of true. The vertebrae, in turn, twisted my ribs, which stretched and deformed my back and trunk muscles. One day, nearly three years after the boat accident, suddenly, I am not in chronic pain. I never did feel the hole in my leg. We were all on the same boat, at the same time, with a shared timeline and history — except for where and when those timelines and histories diverged. This is all true. Four days after the accident, Odette and Kirstin and I are deemed too fragile yet to take the boat ride back across to Isla Santa Cruz, from which we will all fly back to Quito, and so we are put on a tiny plane, an eight-seater. We fly so low over the pale green water that we can see schools of manta rays just below the surface. Panic bubbles up inside of me at the proximity to waves, to open water, and I hold my broken ribs together, physically and literally, with my arms, and that helps. 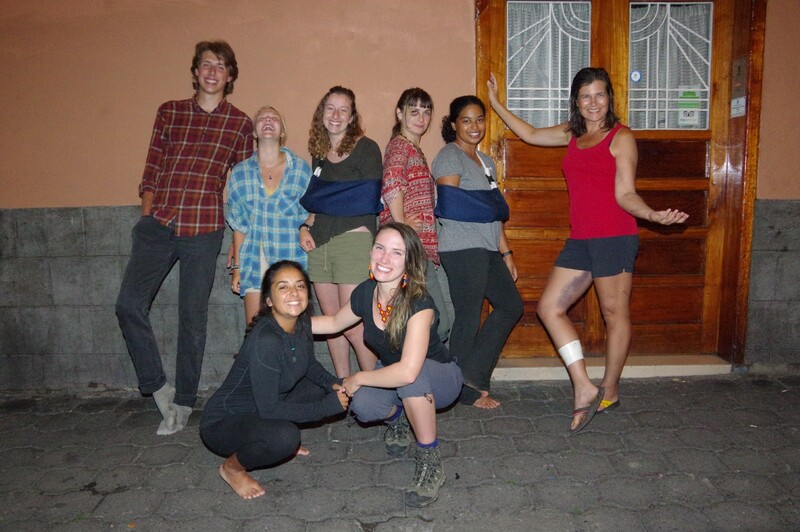 Back in Quito, outside the hostel where we began this trip nearly eleven weeks prior, we pose for pictures. Griffin, true to form, gives us the slip, but the rest of us are there, mostly intact. If you enjoyed this, please consider sharing it. You can follow me on Twitter, and find more of my work here. A daily tweet thread about the study abroad trip on which this accident happened, begins here. Photo, again, by Bret Weinstein. Seeker and communicator of truths. Rhymes with flying.